Mettec manufactures titanium fasteners and components for professional racing applications. Anti-Seize Lubricant. a highly refined blend of aluminum, copper and graphite lubricants are used during assembly to prevent galling, corrosion and seizing and to assure easier disassembly. Check out the Recently Listed Beadlock Fasteners. Check out the Recently Listed Bumper/Nerf Bar Fasteners. 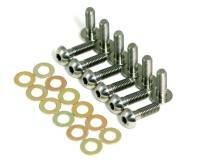 Check out the Recently Listed Exhaust Manifold/Header Fastener Kits. Pit Stop USA is The Online Motorsports Superstore! We feature Front Hub Lug Nuts at low everyday prices. Pit Stop USA is The Online Motorsports Superstore! We feature Fuel Cell Parts and Accessories at low everyday prices. Pit Stop USA is The Online Motorsports Superstore! We feature Header Studs at low everyday prices. Pit Stop USA is The Online Motorsports Superstore! We feature Jacobs Ladders (W Links) at low everyday prices. Check out the Recently Listed Lock Nuts. Pit Stop USA is The Online Motorsports Superstore! We feature Magneto Hold Down Clamps at low everyday prices. Pit Stop USA is The Online Motorsports Superstore! Mettec produces light weight components and parts from metallurgical complex alloys. Mettec brings sophisticated processes and treatments into ordinary use. Mettec quality begins with design and carries through final inspection, and field testing. Mettec products will keep you on the leading edge of material science and process applications. Mettec Titanium Bolts reduce weight without sacrificing strength. Mettec Titanium Fasteners are manufactured from aircraft grade titanium, lightweight titanium fasteners exceed minimum ultimate tensile strength of 120,000 PSI. A wide variety of sizes are available. Mettec Titanium Studs and Mettec Titanium Nuts are made with aircraft grade Titanium alloy. Mettec bolts have forged heads for superior strength. The threads are then rolled to produce greater fatigue strength and reduce galling. Mettec Titanium bolts exceed minimum ultimate tensile strength of 120,000 psi. 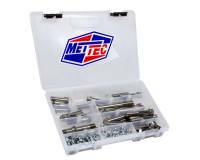 Mettec Complete Sprint Car Titanium Bolt and Nut Kits contain all bolts and nuts for assembly of sprint car chassis. Mettec offers Complete Titanium Sprint Car Bolt and Nut Kits including the Mettec Maxim Chassis Titanium Bolt and Nut Kit and the Mettec Eagle Chassis Titanium Bolt and Nut Kit. Mettec Titanium Jacob Ladder Quick Pin Kits with 3/8a or 1/2" Pin for birdcage heims. Mettec Steel Torsion Bar Stop is 1-1/8" x 48-Spline 1-3/4 bar split. Mettec Anaerobic Surface Conditioner is recommended when installing your Mettec titanium fasteners. Surface conditioner is needed on titanium so that the thread locker will bond to titanium surfaces. Mettec Moly Paste reduces galling and seizing of titanium threads. We feature Mettec Titanium Bolts, Mettec Titanium Nuts, Mettec Titanium Studs, Mettec Jacob Ladder Quick Pin Kits, Mettec Torsion Bar Stops, Mettec Anaerobic Surface Conditioner and Mettec Moly Paste at low everyday prices!